Can revenge reach beyond the grave? When Darren Mullet, an awkward, bullied boy commits suicide, few kids at his school can do anything but snicker, except for sweet Justine, who delivers a eulogy but admits she can't remember ever meeting the boy. But Mullet knew her, and remembered every humiliation he suffered at school. When his unrepentant tormentors begin getting weird and threatening text message from the dead boy's phone, they believe they're being pranked by his only friend, the timid Jason. But when taunting texts turn to actual torture and murder, no one at school is safe and everyone is a suspect – even Justine. The biting and suspenseful Tormented features a bright and talented young cast, including Tuppence Middleton (Chatroom), Alex Pettyfer (Tom Brown's Schooldays), Olly Alexander (Bright Star) and Calvin Dean (The Duchess). There's something refreshing in getting reminded that “adolescents are mean, horrid, monstrous creatures” is an international condition. Lovely, quiet, “Final Girl” Justine is getting courted by Alexis, who draws her into his elite group of friends at the top of the High School social food chain. She eventually learns her new friends were complicit in the death of social outcast Darren Mullet, thought to be a suicide. At the post-funeral party, they start getting threatening texts from the dead boy's cell phone as someone is out for supernatural revenge. Justine's ignorance and complicity-after-the-fact, wanting acceptance, makes her Mullet's target soon enough. She starts scaling the social heights, but it gets easier as the ranks get thinned out in this Brit-take on the teen-slasher film. There's some I Know What You Did Last Summer mixed with some One Missed Call in Tormented. Besides the humanizing angle of Justine realizing Mullet carried a torch for her, the kids' personalities are all drawn in broad strokes: goths, nerds, cool kids. That's okay for this sort of film. It makes for easy storytelling when the chic clique is so obnoxious you're rooting for their demise before the opening credits are done. As British Society is more seriously regimented than in America, it shorthands an extra-vicious power structure. In fact, all the students are such magnificent jerks you're disappointed the ghostly Mullet isn't MORE creative in his methods of dispatching them. Not sure why he wastes time with kids from lower in the food chain but the killing eventually picks up speed The tubby Darren Mullet plays like the Japanese Ghost Girls, peering out behind a curtain of hair. When he appears, bad stuff happens to worse people. While the overall pace of the film is a little pokey, it has a good visual look and the music is age-appropriate without immediately dating the story. You've seen this sort of thing before, but Tormented is, while not a classic, almost the “British Cozy Mystery” of the teen slasher genre. Bullying is a real problem, with very real consequences. This story would be terrifying without the ghost. Tormented is an adolescent revenge fantasy with a supernatural-slasher bent that's an A+ for anyone who fantasized they could have pushed back against the bullies in their past a little more... forcefully. For everyone else it's an enjoyably evil watch for a Saturday night with one's “mates.” You'll feel much better about your own friendships. What if the ultimate nightmare is just the beginning? After three masked gunmen break into her home, bank manager Michelle Estey (Julie Benz, TV's “Dexter”) and her young daughter are duct-taped with explosives and threatened with death unless Michelle cooperates in a daring bank heist. Terrified, Michelle agrees to their demands. She and her daughter are left unharmed, but Michelle soon realizes that, after the robbery, they are still very much in danger. Unguarded by police, shunned by her colleagues, she becomes a suspect in the crime and her shady past is exposed in what becomes the fight of her life in this tense thriller. Held Hostage is a Lifetime TV movie “Based on a True Story” in the “woman in jeopardy” film tradition. The first half is a thriller focusing on Michelle Estey, a contented, independent single mother who's made a good life for herself and her daughter, Breea. A bank manager, she's targeted by a group of robbers who break into her home and terrorize her into holding up her own bank by strapping both her and her daughter with dynamite. It'd be a little too shrill and highly-pitched if not for the talented Julie Benz, mostly known for playing the vampire Darla on “Buffy” and “Angel” and Rita, the traumatized girlfriend on “Dexter.” She keeps the feverish thriller half of the film grounded in reality. The second half takes a turn as the traumatized duo is pretty much left to their own devices by the police, exploited by the media, and left to recover from their ordeal. This is the side of life thrillers never show you; children terrified by every voice in the hallway and families waiting for criminals to get caught so they can move on with their lives. Estey winds up forced to reach out to a family she's separated from and must defend herself when accused by the criminals of being a co-conspirator in the crime. She winds up not also having to defend her past when it gets dredged up and held against her. Bruce McGill appears as a police detective who occasionally seems sympathetic to the viewer while he grows more and more hostile to Ms. Estey. There's a little bit of flashy editing and cinematography, and the “thrills” are front-loaded on the first half of what seems to be two different films bolted together at the middle. The trial half certainly plays to the back row and manipulates the audience. Watch this mostly for the story of a maddeningly twice-victimized woman that would be overwrought and unbelievable if not for the compelling Benz. Held Hostage is presented in Widescreen and in English Dolby Digital 5.1 Surround sound. English and Spanish subtitles, along with a few trailers are the only options. Held Hostage is a “Based on a True Story” Lifetime TV movie. An okay thriller that turns into a drama about crime victims being victimized again by “The System,” it's serviceable for a weeknight in, that's mostly a satisfying vehicle for the talented Julie Benz. This film, reviewed for DVDsnapshot, may just be the biggest stinker this side of... yes... The Room! A young woman (Natasha Lyonne) is forced to re-live a traumatic childhood event, when a vacation in the woods turns into a nightmare with an ex-military sniper (Michael Madsen) hunting them down. She now has to confront her inner demons to come out alive. The editing and audio are as atrocious as the seriously uneven tone of the movie. Most of the actors are amateurish to the point of painful. Natasha Lyonne (playing a character different than the one indicated on the box) seems like a completely different actress than the one we met in Slums of Beverly Hills. Bloated and seemingly drugged, she's painful for her fans – and I am one – to watch. 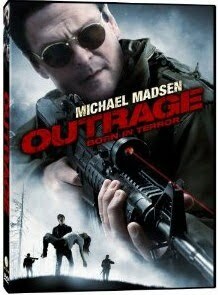 Michael Madsen is collecting a paycheck, but at least he brings some presence. This movie is weird, moralizing, and doesn't know what it wants to be. It's too hokey to please thriller fans and too hippie-dippy to please fans of religious-themed films. It's a soft, soggy “action thriller” with a spiritual bent. If nothing else, you'll (ahem) “thrill” to some of the most senseless character self-sacrifice in the history of movies. Each time you think your jaw can't drop again, it does. This is the most off-kilter film I've seen since The Room, except that movie may just be... better. Outrage is presented in 16:9 full-screen and English 2.0 Dolby English. The only extras are trailers. A muddled movie essentially based on the principles of “The Secret,” it's best to ask the Universe to take it away. If you ask and believe, you will receive... if not a better movie, then at least some free time. Outrage is the backwoods cousin of The Room. Laughter... Plato hated it. The Bible discouraged it. The school you went to, probably, banned it. 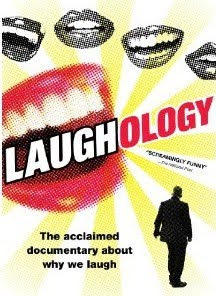 The first ever feature documentary about the subject, Laughology is a "screamingly funny" groundbreaking odyssey into why we laugh and those who would stop us. When filmmaker Albert Nerenberg realized he needed to lighten up after a family tragedy, he goes on a quest to find the cure for seriousness. What ensues is a journey to discover the meaning and power of laughter in a world that desperately needs a good laugh. From the opening treating the subject like the outbreak of a terrible, infectious virus, Laughology is a thoughtful and playful documentary about laughter: what is it and why do we need it? Albert Nurenberg was touched with far too much death in his family's lives and was inspired by his child's laughing to find out how to get his own laugh back. As he discovers, all babies learn to laugh on their own. It's a universal behavior everyone expresses, even animals, who's panting sounds are the evolutionary root and cousin of human chuckles. We express joy through laughter and it heals us. Anthropology, medical sciences, religion, entertainment and education are all checked-in with on this trip through the human history of the healthiest of all contagions (excepting, of course, the African outbreak of "Laughing Disease," which is covered in the doc). Turns out society has a long history of surpressing joy and encouraging seriousness (and here I thought it was just in my life). Some of the anecdotes include how "laughtracks" can calm caged, nervous dogs and a look at "Professional Laughers." Hired originally to be the audience for the TV show "The Nanny" (due to security threats to Fran Drescher), this crew of "Pros" were hired on the QT by several shows and for a golden while, were very lucky people with the enviable job of sitting around together and just laughing. What a marvelous job. Best of all are a visit to the Inuit to learn of their laughter games and strongly encultured respect for the power of laughter and a look at Norman Cousins, a man who possibly healed himself from a degenerative disease through overdosing on "Candid Camera." Being reminded you won't survive if you don't express joy in your life is something we all need to hear. Watching people laugh thoughout the hour, you might find yourself going from a straight face, to a grin, to perhaps being inspired to laugh a little yourself. Even if much of it seems forced in the documentary, it's still a reminder that we need to share laughs. Extras on Laughology include the trailer and some 40 minutes of extra/extended interviews including a look at what the "Laughing Yogi" teaches, which by all rights would make for a killer youtube video. The film is presented in English and in Widescreen, but no subtitles or other options. A quick hour-long documentary about laughter, you might find yourself smiling along. Not necessarily as joyful as it could be, it's hard to be critical of any story as good natured as this look at laughter. You'll be booking a trip to go visit the Inuit and play their laughing games.